Madagascar has an invasive toad problem, and new research suggests that fears about its ecological consequences are well-deserved. Almost every predator native to the island is likely sensitive to the toads’ dangerous toxins. Asian common toads (Duttaphrynus melanostictus) were only recently introduced to Madagascar. They first turned up at the eastern port city of Toamasina in 2011, and have since been spreading along the coastline. The pressing concern among conservationists has been that the Madagascar invasion is another Australian cane toad situation in the making. 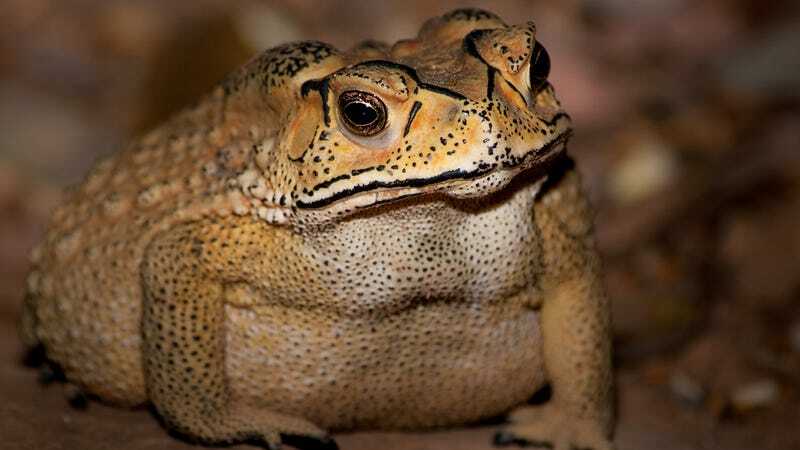 Cane toads (Rhinella marina) and Asian common toads are close relatives, and both secrete powerful toxins called bufadienolides from skin glands. Native predators, which are totally unfamiliar with these poisons, are often especially sensitive: Those that make the mistake of dining on a toad can face lethal consequences. The cane toad invasion in Australia devastated native fauna over decades, initiating dramatic ecosystem shifts and nearly destroying carnivorous reptile populations. The assumption among scientists has been that the Asian common toads are an imminent ecological disaster. But, until now, no one had actually tested if native Malagasy predators were indeed sensitive to the poison. So, that’s exactly what an international team of researchers did, publishing their results today in the journal Current Biology. Fortunately for the team, determining whether or not an animal is likely to be resistant to the toads’ toxin can be accomplished with a genetic test. Previous work with predatory reptiles discovered mutations that allowed resistance to the toxin’s effects. The toxin normally makes trouble by blocking an ion pump on cell membranes, but the mutants have modified pumps that don’t get blocked by the toxin compounds. This evolutionary trick was then found in a wide range of vertebrates, according to Wolfgang Wüster, herpetologist at the UK’s Bangor University and coauthor on the new study. It suggests these mutations are a universal mechanism that allows some vertebrates to eat toads. The team analyzed sequences of the ion pump gene in 77 Malagasy species that might prey upon the invasive toads, including 27 species of snake and eight mammals. Unfortunately, only a single native predator—a rodent called the white-tailed antsangy—showed any genetic evidence of toxin resistance. The seventy-six other species all appear vulnerable to the invaders’ poison. This list includes some of Madagascar’s most unique endemic wildlife, like the strange feline fossa and the neon-striped tenrec—a prickly animal that’s more closely related to elephants than to the hedgehogs it resembles. “We can confirm now that the fears of conservationists about the potential effects of the toad were warranted,” Wüster said. Wüster says it’s hard to know yet if Madagascar is destined for the same path as Australia, as there are plenty of subtle ecological interactions and differences to consider. But because Madagascar is already suffering a biodiversity crisis driven by deforestation, Wüster thinks that the island may fare even worse. As for what to do about the toad invasion, Wüster thinks that humans may have missed the boat on total eradication. In 2015, the toads occupied a 100 square kilometer (39 square mile) area around Toamasina, and the toads have probably colonized significantly more territory by now. The best thing may be to avoid inadvertently carting the toads around the island. The study reiterates the supreme importance of preventing these types of invasions, because so much fragile biodiversity is at stake. “Vigilance and biosecurity really are things we need to pay a lot more attention to,” Wüster said.